What does it mean to 'Build your Brand'? It means building an identity for your company that your customers can relate to in a positive manner. With so many soap making businesses out there, you need something that sets your business and products apart from all the rest. This involves more than just having colour co-ordinated business cards and packaging. It means understanding completely what you are selling and who you are selling too. It requires setting goals, policies or guidelines on how you intend to do business. And of course, it involves creating a unique 'look and feel' that tells people immediately who you are and what you make or do. Building your brand can be a very complex process and since I'm definitely not an expert on the subject, I've compiled a list of links that will give you a good idea of what it's all about and explain how to go about it. Now before you start clicking away...I'll warn you, this isn't light reading. 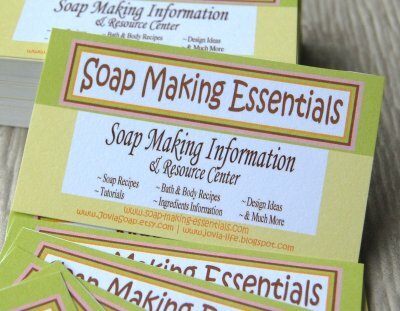 It is however, very important information that you will need if you truly want to be successful in your soap making business. Once you've got your branding plan worked out, you're going to need to have some business cards, brochures, letterhead and whatever else you've decided on printed up professionally. Here are a couple that I have used and was extremely happy with their products. Vista Print - this company is great! They constantly have sales and carry a wide array of products. You can use their pre-made logos and designs or upload your own. I used them for printing the business cards in the picture above. Evermine - beautiful labels and hang tags that you can customize to suit your needs. I ordered some sticky labels for gift giving and they were wonderful.